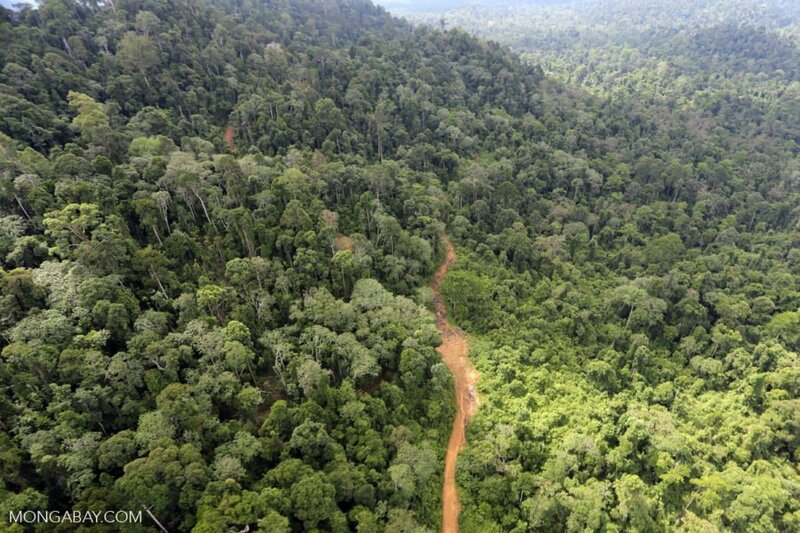 Aerial view of heavily logged rainforest in Sabah, one of the two Malaysian states on the island of Borneo. Photo by Rhett Butler. Forest degradation refers to losses of commercial timber stocks and the carbon emissions that go with those losses. The researchers note in the study that forest degradation is difficult to evaluate because trees are selectively logged from forests with dense canopies, which frustrates attempts to observe these activities through remote sensing technology. But one thing that is clear, the researchers add, is that selective logging is far more extensive than deforestation. It’s been estimated that, between 2000 and 2005, humid tropical forest logging had at least 20-times the geographic footprint of deforestation, according to the study. About 500 million hectares (more than 1.2 billion acres) of tropical forests have been degraded, mostly due to over-exploitation by loggers. And while carbon emissions from this forest degradation typically go unreported, researchers believe they’re most likely equivalent to the levels of emissions from deforestation. Tropical deforestation is responsible for 10 percent of manmade greenhouse gas emissions every year — but that doesn’t include emissions from unnecessarily destructive logging, which also reduces commercial timber stocks and makes forests more prone to burning and clearing, the authors of the study found. Another common problem in the management of tropical production forests is re-entry into logging stands before they have been allowed to recuperate sufficiently to sustain timber yields. The authors of the study found that preventing premature re-entry into previously harvested areas could help those forests retain as much as 34 percent of their carbon stocks. In order to realize this potential, the authors recommend adoption of reduced-impact logging (RIL) together with new wood processing technologies, which is referred to as RIL+. Switching from conventional logging to RIL, the study’s authors write, can maintain the flow of timber production while allowing for the retention of carbon stocks in production forests. The researchers define RIL as a logging practice with well-defined planning, well-trained logging crews, and supervised implementation of timber harvesting operations. 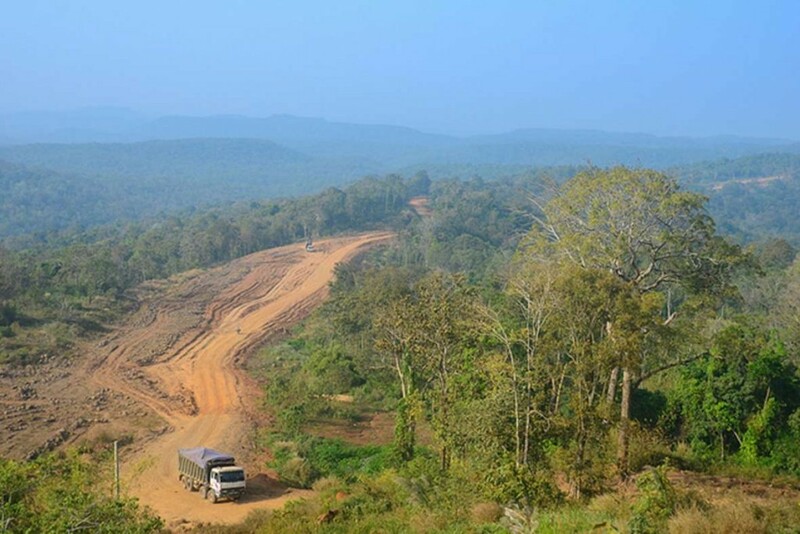 “RIL involves a series of steps that go from pre-planning of the logging activity to preparation of the logging site, to tactical felling of harvest trees to reduce collateral damage, and finally to protection of logged forest to allow for regeneration,” Gregory Asner of the Carnegie Institution for Science at Stanford University, one of the study’s authors, told Mongabay. Asner and team found that use of RIL techniques in tropical production forests could reduce carbon emissions equivalent to 29 to 50 percent of net emissions from tropical deforestation and land use change, while also supplying 45 percent of global round-wood demand. About $2 billion per year would be needed for the adoption of RIL+ in all tropical production forests worldwide. Asner said that the money would mostly be needed for personnel and equipment to carry out RIL+ methods, plus additional funds to ensure that RIL+ methods are certified and enforced. Tropical deforestation is responsible for 10 percent of manmade greenhouse gas emissions every year — but that doesn’t include emissions from unnecessarily destructive logging, which also reduces commercial timber stocks and makes forests more prone to burning and clearing, the authors of the study wrote. Meanwile, in the wood processing sector, new technological developments are providing opportunities to increase the use and longevity of wood products. RIL increases the amount of wood products that can be made from any given amount of harvested timber, meaning that adopting RIL can increase carbon storage in long-lived wood products and reduce short-lived wood waste. To encourage the use of advanced technologies for higher carbon retention in wood products, the authors recommend that future climate agreement should include carbon credits for long-lived wood products as eligible for carbon trading schemes. “Our study suggests that about 28% of the total area of tropical forests (i.e., all the officially designated tropical [production forests]) can be targeted for RIL+,” the team writes in the study. Furthermore, RIL+ can produce 287 million cubic meters of sawnwood per year, while reducing emissions equivalent to 50 percent of carbon emissions from tropical deforestation, increasing carbon storage in sawnwood, and preventing forest fires that are made more likely and more destructive by poorly planned logging operations. Gregory Asner said that he published numerous works on the issue of tropical forest degradation between 2002 and 2009. But a decade and a half later, little has been done to take advantage of this “win-win-win” for forest conservation, timber production, and climate change mitigation. He’s hoping this new study helps promote awareness of the benefits of RIL+ for forests, the climate, and humanity. “Improved tropical forest management is an important element of the UNFCCC’s REDD+ scheme that also supports the long-term supply of commercial timber products and safeguards local social welfare and biodiversity,” Asner and team wrote in the study.